Eli and Edythe Broad prefer their art with a side of showmanship, as evidenced by the selfie-centric pieces ensconced within their namesake museum. But one installation has captivated the masses unlike any other: Yayoi Kusama’s Infinity Mirrored Room—The Souls of Millions of Light Years Away. More than 300,000 people have passed through the shimmering LED display since the Broad opened its doors in 2015; half as many would be lucky to score entry to Yayoi Kusama: Infinity Mirrors (opening October 21), an exhibition that brings five of the artist’s kaleidoscopic chambers together for the first time, plus paintings, sculptures, a living room covered in stickers, and more. Tickets went like hotcakes in September, but more will be released on October 2 at noon. Born in Japan in 1929, Kusama has been plagued by neuroses for most of her life (she lives by choice in a Tokyo psychiatric institution). As a child, she hallucinated sweeping fields of dots, using art to calm the chaos in her mind. After moving to New York in 1957, she created her Infinity Net paintings—canvases filled with minuscule mesh-like loops. (Back then the works sold for $200; in 2014, one went for $7.1 million at auction.) 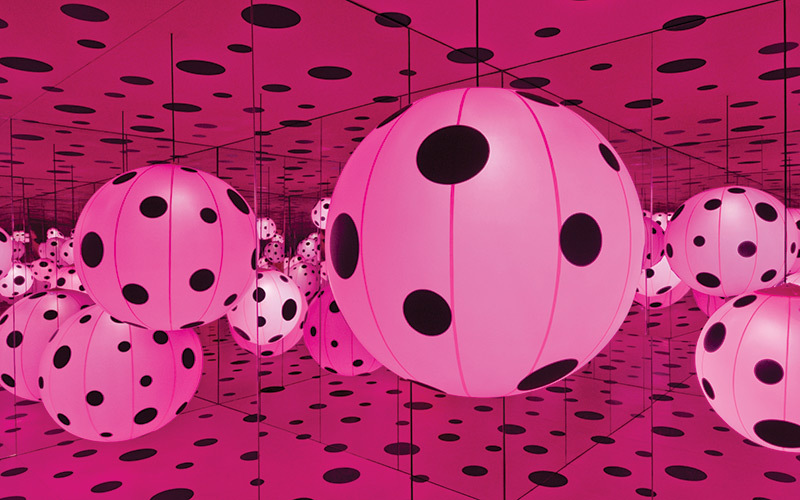 Stylized dotted works followed, including 1965’s Phalli’s Field—her first mirrored room and one that has been re-created for the exhibition at the Broad. Since then, Kusama has made 19 more rooms, each a self-contained universe that reflects her obsession with repetition.